Sorry to have missed a week. I experienced life before the internet as I traveled back-up to Salt Lake City. Absolutely no connection for a week. Odd! Traveling to Phoenix, Arizona is not complete without a visit to Taliesin West, Architect, Frank Lloyd Wright’s winter home, and Scottsdale's only National Historic Landmark. Taliesin West is on six hundred acres purchased around 1937 at the foothills of the McDowell Mountains in Scottsdale, Arizona. Set amid a Sonoran Desert Preserve, Wright’s home commands dramatic views of Camelback Mountain and the Valley of the Sun. When standing on the lawn facing the desert from the main house — in Wright's own words, Taliesin West would be "a look over the rim of the world." 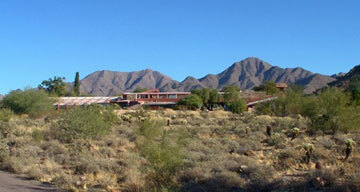 Eighty years after its construction, the desert still consumes Taliesin West whole. It is not until one is on its doorstep, that one can appreciate anything at all of the buildings; they so perfectly blend in with the desert. And once inside one does not visualize anything of this world from the windows in any sitting position. Deeply connected to the desert, Taliesin West is among the most personal of the architect’s creations since it was built and maintained almost entirely by Wright and his apprentices. Taliesin West is a prime example of Wright’s organic architecture in that the structures are built of the rocks and sand of the Sonoran Desert and melds to the lower McDowell Mountains. The next time I’m in Phoenix I would love to visit the David and Gladys Wright House. This house is a 2,500-square-foot concrete house designed and built for the architect's son in 1952. This Wright house was boarded up back in 2014. These days it has been restored and accessible for viewing. My sprained ankle is the culprit for not enjoying this architecture.